American Noise Vol. 2 is the anticipated second limited edition vinyl release soundtrack companion to The Smart Studios Story, a groundbreaking documentary about the history of Madison, Wisconsins Smart Studios and its role in recording and supporting DIY / independent music in the Midwest. The critically acclaimed film chronicles thirty years of Midwest rock history and links early indie bands to the larger story of American rock history. 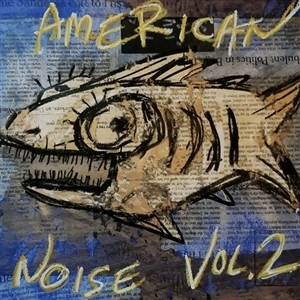 While American Noise: Vol 1 shared the earliest Butch Vig recordings of local, unsigned bands, Vol 2 includes artists who traveled from other scenes in the US to record at the fledgling studio between 1987 and 1993. This era coincides with the growing reputation of producers Butch Vig and Steve Marker -two self-taught, DIY studio owners whose skills took the raw sound of local bands and created polished, powerful analog recordings. Through touring bands, college radio, and The Sub Pop Singles Club, their early work, most notably with Killdozer and Die Kreuzen, caught the attention of credible indie labels like Sub Pop, Touch And Go, and Alternative Tentacles. Following the release of Nirvanas pivotal Nevermind, both Vig and the studio received an explosion of attention. More and more artists sought to record with him and many of them wanted to do it in the crumbling, two-story red brick building on East Washington Avenue. All of the tracks on American Noise Vol. 2 come out of this period. Sonically, it spans the broad spectrum of Smarts clientele at the time. Pop, acoustic, beat and the heaviest of heavy, chuck full of dirt, growl and thump the way Smart was always able to deliver.